…people and businesses for the greater good. And what does “the greater good” mean? It means people and businesses whose mission includes being profitable while treating customers and the planet with respect and goodwill. 3. support the livability of our planet. Yet you may not reach everyone you could help, nor create the systemic change you know you can. Whether you are struggling with first steps to get known for the work you do, frustrated with a lack of customer response, or an established purveyor of the Cosmic Good who wants to reach more people, let’s talk about how your message and mission can be enhanced to better serve those you are meant to serve. 2) writing and editing articles, courses, video scripts and presentations – Sometimes you just need an experienced editor to tighten up your words. I can help. 3) online courses – This is one of the fastest growing service niches today. I can help you develop educational materials that serve your audiences while accomplishing your objectives. 4) writing, ghostwriting and editing self-improvement books – I’ve worked with several authors, the best known is Jack Sc hwarz, one of the foremost authorities in the human potential movement, now deceased. 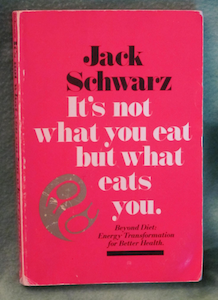 I ghostwrote Jack’s book titled It’s Not What You Eat, But What Eats You. My experiences also give me insight into business. As GM of a natural products company, our company was considered to have among the industry’s best marketing programs. It was based on customer education and excellent industry relationships. Sales more than tripled in less than four years; profits increased substantially. I invite you to contact me about what you need to build a better relationship with your prospects, customers and clients. I am also an award-winning writer for comedy, so I can be a lot of fun to work with! Fill out the form below and we will schedule a free get-acquainted phone call for any of these services. In what copywriting services are you interested?